George Douglas Chew enrolled at the University in 1912, aged 17, to study Engineering. He was born at Sylhet, India, now part of modern day Bangladesh, son of George Frederic Chew, originally from Spreyton, Tasmania, who was an agent with the India Rivers Steam Navigation Company. Chew's hometown was Mymensingh when he first matriculated at the University in 1912. During his two years of study, Chew took classes in Mathematics, Natural Philosophy, Chemistry and Engineering. During the First World War, George Douglas Chew served first as Lieutenant in the 3rd Battalion of The Prince of Wales's (North Staffordshire Regiment), attached 1st Battalion. On 30 October 1915 he was awaded the Military Cross "for conspicuous gallantry and resource [...], when, at great personal risk, he made a reconnaissance in broad daylight of the new St Eloi craters, which resulted in bomb posts being established and communication made. Two previous attempts had failed owing to the Germans being in occupation. Previously, on 18th August 1915, Lieutenant Chew displayed great gallantry at Hooge." He served as Captain with the 10th Battalion of the Loyal North Lancashire Regiment, but was killed in action on 15 November 1916. He is memorialised at the Theipval Memorial, the Somme, France. 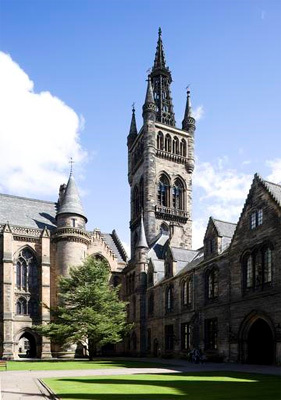 Chew has an inscription on the memorial tablet erected by the Engineering Society of the University of Glasgow in the James Watt building in memory of undergraduates and graduates who died fighting in the first and second world wars. Captain George Douglas Chew is also listed on The Commemorative Roll of the Australian War Memorial, which provides names of those Australians who died during or as a result of wars, but who were not serving in the Australian Armed Forces and therefore not eligible for inclusion on the Roll of Honour.